Reuben's Home Inspection Blog: I'm not saying they cheated, but this doesn't look good. I'm not saying they cheated, but this doesn't look good. I don't know how it happened, and I'm not accusing anyone of intentionally doing something that's completely despicable, but it looks like someone intentionally tampered with a radon test. I recently inspected a home that was being flipped for some young first-time home buyers. The home had a newly finished basement, and the young couple planned to use one of the basement bedrooms as their master bedroom, so they hired me to do a radon test at the same time. For the record, radon causes lung cancer. The radon test was high, so the buyers asked the home flipper to install a radon mitigation system. Here's where it starts to get interesting. The flipper refused, and said they wanted to have the radon re-tested. Why? I don't know. There was absolutely no legitimate reason to have the radon re-tested. We followed EPA protocol for the radon test, using a continuous electronic monitor that we send in for calibration annually. The flipper wanted to have 'their own guy' perform a radon test, using the charcoal canister method. Why would someone prefer to use an older method of testing? I don't know. The electronic monitor gives an hour-by-hour breakdown of the radon levels in the home; the charcoal canister method just gives the final number. It's far easier to tamper with a charcoal canister than an electronic test. The buyer's agent, who is a great guy that I know and trust, warned the young buyers that this was highly unusual. The buyers really wanted the house, so they agreed to have a second test performed. They said the test had to be done by me, and the results would be averaged with the first test. If the average was still high, the seller would need to install a mitigation system. Here's the unbelievable part: the seller crossed off that part of the purchase agreement addendum and wrote "we'll see when the results come back." Um... gee... that doesn't sound suspicious or anything. The buyers went along with it. I received the call to do a second radon test on a Wednesday afternoon. The buyer's agent said we had permission to set the test any time. I told him we'd try to get it set on Thursday morning, but someone from my company was able to set the radon test later that same evening. In other words, we set the test earlier than planned. When I picked up the radon test at 6 pm on Friday, the bedroom window was open. The window wasn't open when we set the test. It was below freezing outside, the house was vacant, and the temperature was supposed to drop down to the teens that night. So why was the window open? 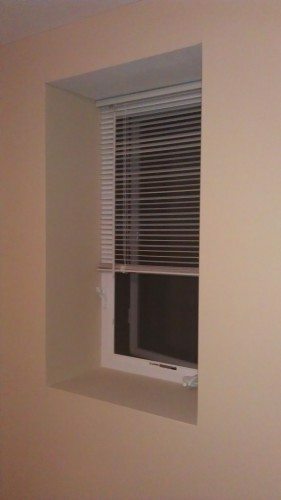 I took a photo of the open window and immediately notified the buyer and their agent that the test was invalid. I ran the test anyway, just because I was curious about the results. The radon levels were almost identical to the first test we did, up until the last four hours, when the levels plummeted. I have no doubt in my mind that that's when the window was opened; there is no other reasonable explanation for the sudden drop in radon levels. The graph below shows the hour-by-hour breakdown. Did someone open the window on purpose, with the idea of coming back early the next day to close the window? I don't know. I'm a trusting person who gives people the benefit of the doubt, but I'm having a hard time even entertaining the idea that this was an accident. What do you think? What would you do if you were the buyer? Yeah, something is fishy about what is going on. The seller can just refuse to install the system. Amazing. We deal with radon a lot here in PA and it is obvious you do as well. Cal - yes, the seller can do that, but if it ends up killing the deal, the sellers then need to disclose to any other potential buyers that the home has high radon. Reuben, in the middle of winter?! Looks like someone was trying to bag the system...I would have the price adjusted and have the buyers put the system in...i wouldn't trust the seller. I'd say you were justified at pointing a finger Reuben, that window didn't open itself. Wow! Ginny - I think I'd say the same thing. Roger - and at a vacant house? Someone made a special trip over there to do it. Reuben - Wow, that does sound suspicious. if the test needs to be redone, I wonder if you can install a video camera. Sounds very fishy, especially if no one is living there. Reuben: This is suspicious at best. Readon systems have come way down in price, so what's the big deal. Do you really think they will diclose if the buyers pull out? Reuben...the cost of a mitigation system is not really that much (relative to the price of a house) so it all seems so unnecessary too. I was at a home inspection the other day when the listing agent told me that the radon test was a waste of money! He basically implied that radon was no threat and actually said that if radon was an issue to open the window! Anne - Good point. Based on what I saw, I get the feeling they wouldn't disclose the radon. Reuben - that is a big red flag. I think walking away is the best option for the buyer. I would wonder what else the flippers did, (or didn't do) to the house while fixing it up. I would walk away. (But I understand the heart when it comes to a house you really like too). Obviously this seller does not know the potential peril of committing a fraud. Sounds like this could be a deliberate attempt to conceal an adverse material defect. Unbelievable! I would not want my buyers purchasing the house without the mitigation system put in BY THE SELLER. If he refused I would advise my buyer to walk away. The Radon results would need to be disclosed for the next buyer and would either scare them away or the seller would wind up installing the system. SELLER SHOULD JUST AGREE TO INSTALL THE DAMN SYSTEM! So frustrating! Sounds pretty fishy to me. I had a local contractor tell me he can make a radon test say whatever he wants it to say. That's a little scary that he would mess with one. It if looks like a duck, talks like a duck, and sounds like a duck... it's a duck. I see giant red flags here. Please let us know how it works out. Sounds suspicious to me. What did the buyers do afterward? I use the E-perm devices and am not familiar with the hour by hour results, but to me the results look wildly various. Is that a common thing? But I'm sure the window opened itself. So no worries! I admire your diplomacy, but this seller is clearly trying to skew the result and wiggle out of installing a mitigation system. The buyers sound like they have their hearts set on this house and are a bit blinded. No matter, you did your job and at the end of the day the buyers make the choices. Wow! So how did this all turn out??? I recently had an agent I was covering for ask that I go to her seller's house and "air it out" prior to the radon test being set up. (Sellers had already moved out.) I didn't do it. Just did not sit well with me at all. Completely suspicious. You don't need a camera that records for 48 hrs, just one or two that are motion activated. Does the seller or seller's agent now have to disclose the results of the two tests? (Assuming the current buyers walk.) The seller would have to in Oklahoma or the Seller's Agent would have to disclose via an addendum. All our disclosures are attached to the listings online, so if would be easy to check. Curious how this was resolved. If we represented the buyer we would ask for a mitigation system provided by the seller. Of course, they would not be obligated to do so. Reuben, this one has red flags all over it. Radon tests are not mandatory in our area, but we do have cases of radon. It doesn't cost that much to mitigate radon. Did the buyers walk? Hey Reuben, that is an unfortunate situation. This type of behaviour on the seller's side makes me second guess any other work that might have been completed as part of the flip. Did the buyers walk away? It certainly appears as if someone was trying to pull something, however, at the end of the day, the decision rests with the Buyers as to whether or not they are going forward and if they are willing to go forward if the Seller still refuses to do anything about remediating the radon. I am curious as to what the Buyers decided to do. I will trust until they prove I should not trust. However, major red flags here! This wouldn't work for me and I would be advising my clients to take a deep breath and think through this purchase. Flipper here seems to be only out for their own benefit. I too use a CRM and have had the hourly readings have fluctuation out of the normal, indicating door or window openings or as I noted one time a fan directed to the unit to try and keep readings low. I have since installed a Data Logger to help aid in the determination of tampering with the readings. Closed house conditions need to be maintained. Definitely fishy. No matter how much the buyers like this house, there are others. Seller needs to pay to have the mitigation system insta.led or no deal. Moving on! Reuben, in Northern Virginia if the Radon level are higher it is a material defect and the seller has to disclose to the new buyer about the Radon level. Lot of red flags hope the buyers made a right decision. It's probably a scam keep the buyer from knowing the true radon levels. The flipper knows and most likely doesn't want to spend the money on mitigation. I would walk from the deal, what else is the seller potential hiding from the seller's. I too am curious of the final outcome and decision of the buyers. We don't have much radon testing here in WA State so it's always interesting to me to hear about what kinds of issues agents run into in other areas. Reuben, I am so glad I am not involved with this kind of testing---what a nightmare. No mystery. But they understand the repair necessary. Ventilation system to disperse the radon. They were just testing it out. This is in Minnesota? Now? Like in winter? Don't people sometimes increase the radon test reading by trying to cheat a radon test? Yikes!! If radon is a big concern for these buyers then they just need to cancel out and move on. Or be prepared to eat the cost for remediation. The seller has clearly shown they are not going to take care of the problem. Reuben -- you, unfortunately are caught in the midst of this process. Buyers should either 1) insist on approved/inspected radon dispersion system - at no price increase; 2) deduct the cost of such a system from their offer, or 3) walk away. Mike Y - possibly so, but they're a little too in love with the house. Cindy - I wondered the same thing. Richard - no doubt. Are they forgetting that radon causes lung cancer? K.C. - their agent was VERY frustrated. Mike C - definately. I once had a friend of a client say that he moved the radon test out of his house and put it back in right before they picked up the test. I was just speechless. Jared and Amanda - I had the same thought. The buyers asked for a mitigation system, and the sellers agreed to pay for half. The buyers accepted. Brian - they're splitting the cost with the seller. Jay - yes, radon levels will fluctuate, but the averages don't change much. When I don't factor in the last four hours of this test, the average is 4.2. On the first test we did, which we left in the house for four days, the average was 4.6. James - it sure looks that way to me! I didn't actually see them open the window, but it doesn't get much more obvious. Peggy - good for you. Radon has a short half life, so airing out a home really won't make much of a difference, but kudos for being honest about it. Than - good point about the camera. Yes, here in Minnesota, high radon levels need to be disclosed. Bill - I completely agree. Richard and Jean - they split the cost of a mitigation system. Michael - I'm pretty sure they considered it, but they still wanted the house. Kevin - no, they're pushing ahead. There was no shortage of shortcuts at the house though. Susan - the buyers are still in love with the house. They're moving forward. Alan - I've considered buying one of those machines that takes the extra measurements, just for situations such as this where I'm already suspicious to begin with. Steven - it's funny how obvious a tampered test is, isn't it? Karen - in the end, they agreed to split the cost. Bryan - that's certainly how it looks. Richie - what really bugs me is that this isn't just about money; this is a health issue as well. Nathan - I'm sure the buyers considered it. Reba - they're splitting the cost. Charles - why don't you test? Is it just one of those things that you're happy not to hassle with? Erv - that's one way to look at it. Bryant - thankfully the sellers agreed to pay for half of the mitigation system (not install it). Steven - they came close. Give them you're results and the facts about what you think happen. Don't get caught in the middle. What an intriguing serious of events. As a buyers agent, I would want to know what the cost of the mitigation would cost. I'd not even waste any more time on the radon "testing" . . . it's clear the home has higher levels and should be mitigated, and the sellers are aware of this. I'd not waste time on finding out who opened the window and why. We can only guess since it's obvious the seller will never be forthcoming. So . . . to hold the deal together, I'd find out how much the mitigation would be and write up an Addendum to either off-set the cost of the mitigation on price, or get a buyer's credit at closing. I would not give the seller the opporunity to do anything further since I wouldn't trust him as far as I could throw him. I'd also talk to the lender about the matter. Does the lender know about this?? But in no uncertain terms, the listing agent would know, as well as the broker in charge. If the deal falls out they would have to disclose. Your clients are lucky you were vigilant on their behalf. Reuben, it is just not an issue on this side of the mountains except for some isolated areas near Vancouver WA. Plus we can discuss it sometime if you want---but I think the whole issue of radon is entirely blown out of proportion. Luis - it was tough to do that without sounding whipped up. Carla - that's about what happened. They didn't try to figure what happened with the window, they just said "we want this fixed." Charles - remind me to ask you about this the next time we chat. Yea I smell a rat. Those buyers must have really wanted that house to pay half and that seller must have really known it had radon to pay the other half and get rid of that house. BTW, what would that procedure cost? Reuben, That sure would make me nervous about the rest of the home and what may have gone on behind the finishes. I would advise them not to buy the home and move on. If it stinks, it's fishy. Big red flag that would make me wonder what else they might be hiding. I'd definitely suggest to my buyers that they consider moving on and give them my opinion on the lack of ethics seemingly involved with regard to the radon test tampering. Interesting topic of Radon. I'm still sorting out the published information from the EPA, WHO, Forensic Industrial Hygenists, and Radon Therapy Centers. I always like to ask my doctor how many Radon related cases of cancer we have in town. Back to your observation of an open window and Radon testing. In my experiences with Radon testing tampering, an open window has increased the Radon reading in the home. Radon is heavier than air and will accumulate on the lowest level of a dwelling. Significant air movement is required to disperse the Radon in air. A single open window is more likely to increase rather than decrease the Radon level. Entry/exit (open door) in winter is more likely to effect the Radon level in the lower level of the home since the outdoor air is colder than the warm conditioned air of the home. I think your test is valid and reasonably represents the Radon concentration in the home. Simply a matter of investigating the changes to the home that correlate to the changes in Radon level. Great observations, nice blog, and interesting comments. Always a pleasure to read your blog Reuben. Extremely suspicious behavior and hard to not think the worst. I mean, a window open in the winter? Second - You could get a motion activated video system which uploads directly to youtube (sounds like I have a few eh). But it brings another point, should we go around and be SO suspicious of the world? In most cases people are honest and do the right thing. Third (I know - math is not my strong side). If this is the sellers behavior pattern throughout, I would want you to go over that house with a really fine tooth comb - again - because I am guessing there are a few corners cut - I know it is hard to see when the walls are closed, but I would make sure my clients understand what they are getting into. I ALWAYS give them an idea how the finances on a flip works, so they can see if the flipper is making 30k or $25 (The latter happens for clueless flippers a lot). While I have never experienced this, my favorite home inspector has, so he always hides the radon cans when others (including me) are not in the basement. Only he knows where they are - and he's very good at hiding them. If it walks like a duck and sounds like a duck....it's a duck! We just had a closing where they had to go to a Phase 2 mitigation, not exactly cheap but they didn't want to lose the sale. I learned a ton about Radon during the transaction as well. Wow, that strikes me as extremely suspicious. If they're doing that, what else are they hiding in this flip? I would be urging my buyers to RUN away from that home. It sounds like the buyer should price out the mitigation system and choose to pay for it themselves if they want the house. If they can get an concession to cover the costs, perfect. If not, make a decision as to whether they still want the property. What type of system is installed to deal with high radon levels? We had a positive low level radon level in a house we recently sold, and the buyers were told by the inspector to open the doors and windows on occasion and run a fan to move the air out. The seller is going to have to disclose there is radon in the home even if the buyers walk away. That is good to know about the different testing methods and how they vary. From the graph, it appears the levels dropped within normal range once the window was opened. If so, can people just open windows to ventilate the home vs. installing a mitigation system? Though, it would be too cold to ventilate this way during the winter months. It is criminal - it really needs to be reported. This is a very interesting post- I have gone to several radon information classes where they have said repeatedly that an open window or door would cause the radon result to go up rather than down... Let me be clear I am not contradicting you- just trying to learn the truth- I will be following to see your response. Somewhere down the line, these flippers will be facing a lawsuit if this is their standard procedure when a problem is pointed out. i learned a lot today about randon in your blog than any of the randon inspection before. wonder about the honesty and ethic this day? Kinda makes you sick that they'd try to cheat over something that is a health hazard. Slimy sellers. Why wasn't this incident reported to the state EPA for resolution and the DRE to investigate? This definitely looks like something that needs to be investigated further. Interesting post - Radon isn't much of a problem in our area. Most homes do not have basements and our soil isn't conducive to radon. Radon testing is something that just isn't done. Did you know that January is Radon Awareness month? This is an intresting article from NPR. Always learning something new at Activerain! That seller needs to be reported before he makes someone really sick. The test needs to be run again AFTER a webcam is set up. I would say that the test was tampered with. Why in the world people knowingly do something like this is beyond me. Radon is very, very common in Maine. Mitigation costs for radon air are usually reasonable, around $1,000. Honestly, I can't believe that someone would try so hard to get out of this. And we have tried retesting after sealing any holes or cracks in the basment floor, etc. There was never any material difference i.e . you still needed a mitigation system. To Shannon, #68, I have heard that an open window can produce a chimney effect and actually draw more radon. Well, you don't sell many homes do you? I would not trust the test from the buyer if I was the seller. I would conduct my own as a seller. As the seller, I wouldn't trust your results either as how would they know of your work ethics? Just saying, that normally no one trusts anyone after all these tests. I even don't trust machine calibration that some say they get. I would see what the total was of 3 tests. If you think the seller tampered with the test, if they find out there are elevated radon levels (at least in IL) they have to disclose it. If it's a vacant home, it's not impossible that kids or vagrants have been getting into the house through a window. However, the seller's behavior is suspicious. The buyer has the responsibility and right to an inspection by the inspector of their choice, to request that the seller install a mitigation system if the levels are too high for their acceptance and then the seller has the right to refuse to install it at which time the buyer has the right to cancel the contract based on their inspection contingency. Unless the buyer initialed any changes on the contract, the change by the seller is not legal. Thank you Reuben for sharing with us! I agree with Bill. Mike Frazier - an average mitigation system costs about $1500. Charles - I'll be interested to read it. Donald - I found a ton of stuff during my inspection. I'm sure there were a few things I didn't catch as well. Jim Mushinsky - talking to your doctor about 'radon cases' is just like talking to them about 'second-hand smoke'. We know it's not good for you, and it contributes to lung cancer. If it can be easily controlled with a mitigation system, and the mitigation systems dries out the basement too, go ahead and mitigate. Easy. I gotta disagree with your theory that this is a valid test, and that the open window would actually increase the radon levels. The first test, which was in the house, averaged 4.6. The average of the second test was at 4.2 until the last four hours. I don't think it could be any more clear. As always, thanks for reading. I always appreciate hearing your viewpoint. J. Philip - exactly! What else would someone open the window? And that one in particular. Terkel - I definitely wouldn't have the seller install the system either. As for the video, I'm really not that suspicious. I trust people. Maybe I'm a little too confident with my inspections, but I honestly don't think I'd find much more at the house even if I spent another eight hours there; almost certainly not enough to cover my fee. Valerie - I'd love to ask your home inspector about that practice. Gene D - what's a 'Phase 2' mitigation? I've never heard the term used. Wendy - I'm sure there's plenty. Mike - that's what they're going to do. Karen Fiddler - I'd like to, but I can't prove it was the seller, and I can't prove it was intentional. Patricia - exactly. Here in Minnesota where the windows are kept closed for half the year, opening the windows isn't a feasible option. Raymond - I don't know who I would report it to though. Shanna (#68) - great point, and I've said the same thing many times. Radon tests are placed in the basement, and usually when people open a window, they're opening a window on an upper level. When this happens, the warm air at the top of the house leaves through the window, and air gets sucked in to the basement to replace the air that's leaving. This is called the 'stack effect' or 'chimney effect'. This is what increases radon levels. On the other hand, when basement windows are opened, the air the basement essentially gets diluted, thus lowering the radon levels. Carolyn - I hope so. Kimo - I don't try to police other people's business practices. Rocky - I say get it fixed. Ann - I forgot all about Radon Action Month. I meant to do an extra post on radon this month. There's always next year :). I agree with the author's take on radon; if it's not prevalent in your area, why test? Cynthia - look at it like sports. When you cheat, you forfeit. Margaret - the mitigation companies in my area say the same thing; sealing cracks does basically nothing. Lyn - what incentive would the home inspector have to lie? Alyse - you're right, there's no way to prove this was the seller's doing. Thankfully the seller will be paying for half the cost of mitigation. Emilia - thanks for reading. hinton - please tell me more. I liked Ginny's (#3) comments. Reduce the price and let the buyers get the system installed, so they know it is done right! We don't see the Radon issue around here that much. If I was the buyer I would run away from this deal. The radon mitigation system installed in my daughters home in Lakewood, CO only cost the seller about $1500 on a $190,000 sale. Some people sell out their ethics cheaply. HOPEFULLY, THE BUYER WALKED AWAY!!! If there is a little fraud, there is a lot of fraud!! Woody - yep, that's the best option I think. Gene - I'm sure they considered that. Marshall - exactly! That's the same price I always give an an average for a mitigation system in our area as well. Paddy - I think they're moving ahead. They love the house. First of all congrats on the Featured post well written indeed. Looks like there was an intentional, misleading act to lower the levels of the readings. The sellers probably knew the Radon levels were high to begin with. Why else would they be against getting a reading for Radon? Good job in noticing the "changes in the space". I would have thought the same thing. I hope it all works out for you and the buyer. Wow, that's really amazing. I don't even know what to say about that story! I'm glad you caught it, otherwise that reading would have been confusing! Run! As an inspector you know that the home inspection is not an exhaustive or intrusive inspection. Since this home was rehabbed and the current owner is acting irresponsibly, you have to wonder what else is hidden in the home structure that won't show up for a few years. We did an inspection on a house for a buyer - the inspector found a problem with some roof shingles that weren't installed correctly. The buyer walked away. About two months later we got the job to inspect the same house for a different buyer. The inspector reviewed his notes and found that the roof shingles were still not installed correctly and more shingles were slid ontop of them to hide them! The owner had the bad luck of getting us twice! anyway, I would be skeptical about the house. The buyer would probably have trouble with the repair negotiations also. i'll bet the investor gets radon test's on the next property he buy's in the area before he closes!! some area's are higher then others in radon! buyers should always run from this kind of flip,what else did the seller cover up! Tell the buyers to RUN! Obviously the seller doesn't want to remediate, let alone pay for a system. And to think that systems are much cheaper where you are, than in Arizona. I paid $4800 for 2 systems in my previous home and was told that up north and on the east coast they would have cost half that! Very sad situation when a seller even entertains the idea of lying! Hi Reuben, if I was the buyer's agent I would warn them to run or get a strong disclosure signed by them! Reuben, did this property have multiple offers? Are properties moving quick in this area? We have multiples on a lot of flipped houses, so I can see why buyers would want to push on. BUT, when the ink is dry, and if there are problems, they'll feel a lot differently about the fact that they had to pay for something so glaringly wrong. On a house being flipped, if they wanted to cover up something like Radon, I'd be wondering what coreners they cut in other areas of the remodeling. In Illinois the performance of Radon tests is pretty routine, not so much because of the high prevalence of high radon readings in most homes (about one of three will show some elevated radon), but because Illinois has a radon disclosure law and that flipper/seller would have had to sign that disclosure. The scenario described here is highly suspect, particularly if it were to have been done here since when the radon tests are set, they are accompanied by instructions that clearly indicate "closed home" conditions which include doors, windows and chimney flues. If any are open, the test is considered invalid and if they are open when they come to set it up (i.e. a flue which sometimes happens since it is not as readily visible), running the test is delayed till closed conditions are established and confirmed. Sounds like someone is trying to skate on this. I agree with the poster who said if the flipper tried to avoid this, what else is "hidden" in the reno that does not comply? I'd be VERY careful with this one! Looks can be deceptive and that might well be the case here. Stumbled across this old thread. We are in the process of closing on our first home. We had a radon test performed and showed up the next morning for our inspection..EVERY WINDOW OF THE HOUSE WAS OPEN. At first we were furious because it had stormed the night before and were worried about the hardwoods. Then we found out the seller was cheating the test. Right there on the kitchen counter was a sign that said to keep all windows closed,etc. So strange to me as I know the seller is a very wealthy lawyer who was only using the home as her law office and is selling because she set up another office downtown. Our inspector found nothing else wrong, he did find a Mitigation system that was not working. So this women would rather have us living in danger than spend a couple hundred on fixing the fan on the ALREADY installed system. Anyways, they retested and I staked out the house and it came back at 5.8. We're having her pay to fix it. The closing table will be so awkward and I'm furious!!! Unbelievable. I'm a flipper, and this stuff just makes me cringe, because it's stories like this that gives our industry a bad name. The problem with most fix and flip guys is that they don't know what they're doing and overpay for homes or repairs (or both) and so they have to either a.) overprice it or b.) hope nobody notices all the places they cut corners in order to sell it at market value and still make a profit. I would advise the buyers to RUNNNNNNN!!! !